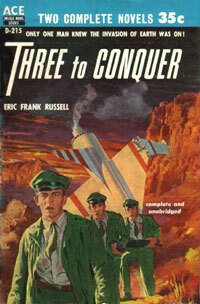 Three to Conquer appears to be a novel of cleanly minimal science fiction; or if you like, a science fiction novel which is both straightforward and subtle. 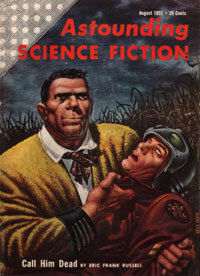 Three to Conquer was serialized as Call Him Dead in Astounding Science Fiction in 1955. Both titles fit the story, but Call Him Dead is one of the noncommittal teaser type of Astounding titles; on the other tack, Three to Conquer gives away something of the plot in paperback thriller fashion. I never liked either phrase, and neither conveys the feel of an Eric Frank Russell novel. So how is it minimal and subtle? It's an invasion-of-Earth story, with engineer-businessman Wade Harper, a likeable, quick-thinking, and competent hero, as the only man who can detect the aliens among us. Harper is a telepath — as far as he knows, the only one. The aliens are parasites rather like those in Hal Clement's Needle (1950); they can live within humans and take them over. Alien-controlled people can act in society just as they had before when purely human. Only their minds give them away — and only to a nearby telepath. The ex-human people are only slightly different; you and I couldn't tell an ex-human we know from the man he used to be, but his persona is gone, replaced by an alien's. Call him dead. But who will believe you? A parable for treason and subversion in any age. There are no special effects in Three to Conquer, no spaceships on stage and the aliens look just like us — they are us, one by one. Except in trivial details the story is not dated. One would think this an obvious and inexpensive movie to make, so cleanly plotted that just following the book should turn out a great movie thriller. Unfortunately Hollywood hasn't taken it up. How to detect alien control? How to find alien-controlled people when only one man can detect them? A good problem. Eric Frank Russell earlier had tried mixing the elements of up-front police procedural with off-stage space travel, in Dreadful Sanctuary (1948), which despite a brilliant concept spends too much time just chasing around, physical movement that doesn't advance its plot. Three to Conquer is tighter and smoother. Another antecedent is Robert A. Heinlein's The Puppet Masters (1951; unabridged version 1990), the absolute masterpiece in the generally laughable category of invasion of Earth via flying saucers. There was a boom in saucer sightings when Heinlein wrote his novel, in which the aliens are parasites as are Russell's here. Heinlein's are grosser, more physical, with inroads much more widespread before discovery. Heinlein's people have to fight a war against foes numerous and entrenched before they're properly analyzed. Russell's situation is smaller-scale on both sides, more like dealing with a first wave of saboteurs landed along the coast. This invasion is noticed at an earlier stage and Three to Conquer is a shorter and more intimate novel. "It's a lousy business. I've yet to tell his wife. They hadn't been married long, either. God knows how she'll take it." He sighed again, dug an official form out of a drawer. "Have to do some clerking myself, seeing all the boys are busy. You got a card on you, Mr. Harper?" Harper slid one across to him. It read: WADE HARPER — FORGER. "So help me Mike," said Ledsom, blinking at it. "That's what I call advertising one's sins. Next thing one of them will write me on a business sheet headed: Baldy O'Brien — Heistman." "What sort of animal is that?" "I make surgical and manipulatory instruments so tiny that they can be used to operate on a bacillus." And so on. Harper has a sense for humor and irony as well as the tragic, he's a determined individualist who has to work somehow with the official bureaucracies — or else. Harper realizes that a covert and nasty invasion is on, takes quick action to stay alive himself, and tries to figure out what can be done about it. The reader is smoothly swept along. Russell makes you wonder, involves you in the suspense of detection and counter-action, adds a good leavening of humor. As either Three to Conquer or Call Him Dead, a fine novel.